As with any large city, there is a large mix of architecture and density. 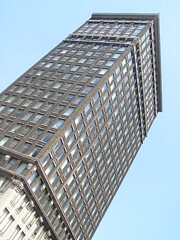 Detroit is no different, but most are unaware that the city has been known to boast having the most surviving pre-depression skyscrapers in the nation. How is this you ask? Fortunately the city never tore them down in a nasty thing called urban renewal. The large urban renewal that swept the nation around the 60s never occurred in Detroit because there wasn’t as much progress in the city, so the plots of land that contained skyscrapers didn’t need to be cleared for new developments. Anywhere you look in the city, you will see a pre-depression building, whether it be the colorful Guardian Building (in my opinion the best art deco skyscraper in the wolrd), or the soon to be restored Detroit Life Building. The fine works of art contained within the city display the workmanship no longer seen today. Architects such as Albert Kahn, Gordon W. Lloyd, Louis Kamper, Daniel Burnham, Wirt Rowland, Charles Crane, and firms like Donaldson & Meier, Smith Hichman & Grylls mark a distinct mark on the city that lasts today. While most of our pre-depression buildings are unaltered, a good amount have had their conice removed, not to modernize the building for the future, but because of strict regulations placed on any cornice in 1958. This is all because the lack of maintenance given to them because owners simply did not care for something that they considered gaudy and out of style. Soon enough the cornice from the Ferguson Building killed an older woman shopping in 1985, and the regulations went into place. Despite this, many of the buildings still take the eye of the viewer in different ways. 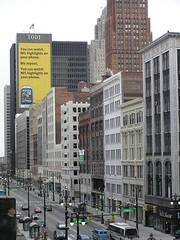 Along with pre-depression skyscrapers, downtown Detroit has the most theater seats in the Midwest, outside New York. This is due to the nearly half-dozen vintage theaters that exist downtown that host events. All of them are historical, and half of these are movie palaces, which were designed by C. Howard Crane. So with this, I present to you our gift to you, our pre-depression stock of architecture. Just please don’t tear them down for any urban renewal or parking lots now, we already have enough parking! You better hope you can get Preservation Wayne to hop onto this gift, as you can’t get a better tour or our architecture from anywhere else. Great pick! I definitely agree that the Guardian Building is a beautiful, and in my opinion, under-appreciated downtown gem.